The map comes from page 413-414 of ” The Earth and its Inhabitants: Africa (South and East Africa)”, authored by Elisee Reclus and published by the D. Appleton and Company. 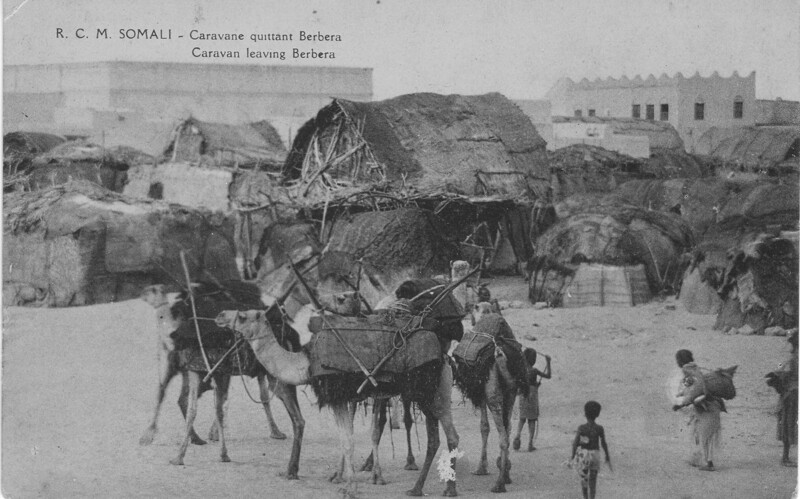 1889.
tradition, here died the great Sheikh Ishak) ancestor of all the Habr or ” Grand­mother” tribes, which belong to the widespread Hashiya division of the Somali race. 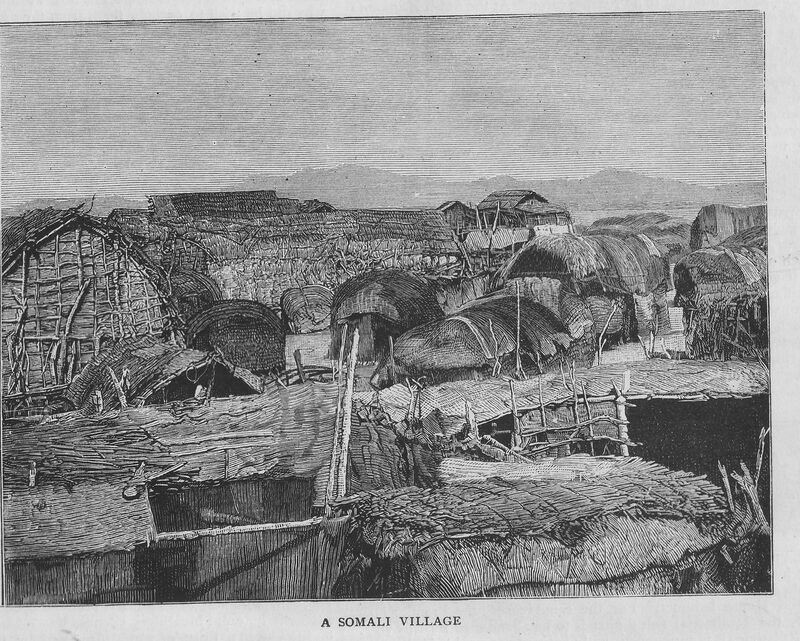 Formerly the Somali advanced in years came from all the surrounding regions and settled near the venerated shrine, in order after death to secure a last resting-place near the remains of the founder of their nation. All the houses and cabins of Mayet were at one time grouped round about the tomb of the saint; but they have since been displaced in the direction of the west, near the mouth of a little coast-stream. Towards the north-east is visible the volcanic islet of Jebel- Tiur, or ‘Bird Mountain,” which contains a deposit of guano, and to which the English have given the name of Burnt. Island, from the colour of its lavas. The island is annually visited by about forty Arab dhows, from the port of Makalla in Hadra­maut, returning laden with cargoes of this manure for their tobacco plantations. to all the coastlands skirting the south side of the Gulf of Aden. Yet notwith¬standing its obvious maritime advantages, this privileged seaport has at times been completely abandoned. 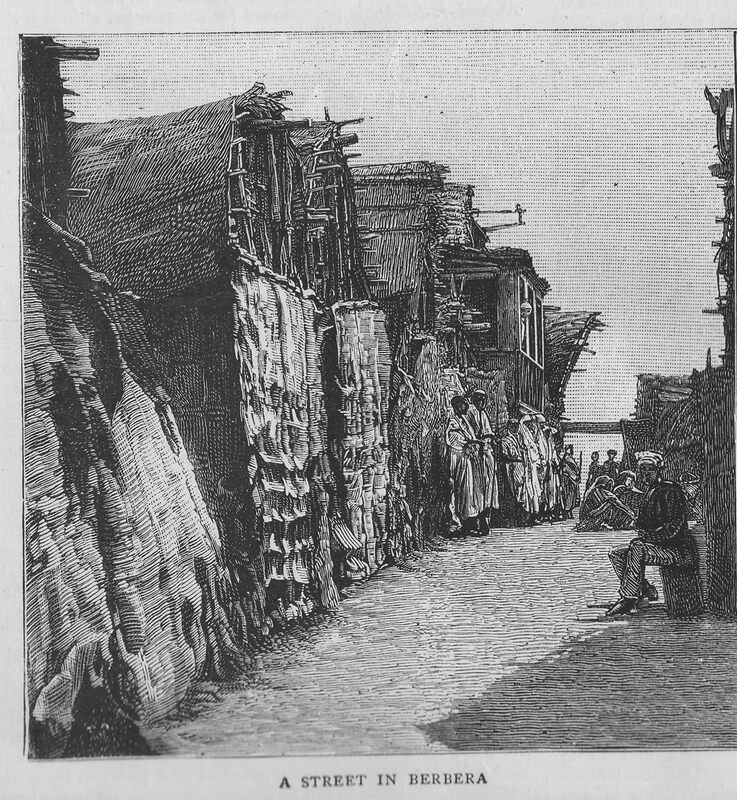 Thus a war which broke out in the year 1870 between the surrounding Gadibursi and Dolbobant nations compelled all the inhabitants of Berbera temporarily to quit their homes. But under the protection of Great Britain, which has inherited all the rights of Egypt as the ruling power on this seaboard, Berbera has again become the centre of considerable commercial activity. It has now a lighthouse, piers, warehouses, and even an aqueduct, whose copious water, thermal at the fountain-head, is brought from a distance of about seven miles. Berbera is the successor of Bender Abbas, another town some ruins of which are still visible on the low-lying shores of the Tamar peninsula enclosing the road¬stead on the north and north-west. 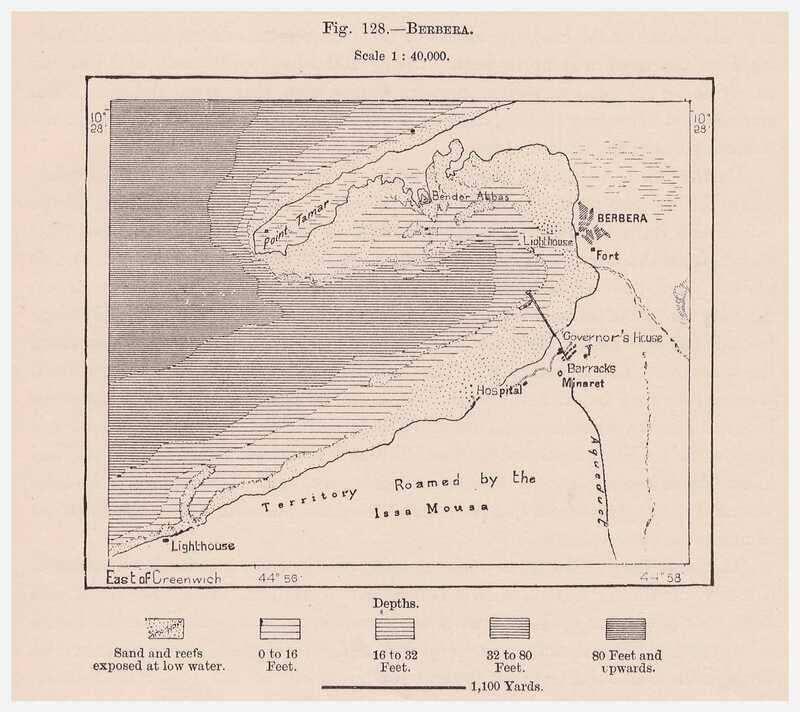 Lying 160 miles to the south of Aden, and nearly under the same meridian, Berbera shares with that town and with Zaila, another port belonging to England, the whole of the commercial movement in the western parts of the Gulf of Aden. On the beach at Bullhar, about 45 miles farther west, lies the market-place where the Berbera traders meet the caravans coming from Harrar and from all the Somali and Galla Lands to ,the south and west of that place. During the busy season, from October to January, as many as 15,000 persons are attracted to this place. Then, after all the commodities have changed hands, the tents are struck, the long strings of camels laden with their purchases move off in all directions towards the interior, the Arab dhows set sail, and solitude once more prevails along the seaboard. The Somali prefer the Bulhar market to that of Berbera itself, because they find in the, neighborhood convenient pasturages for their numerous herds and Hocks, whereas round about Berbera nothing is offered except here and there a few trailing plants and shrubs. Bulhar has unfortunately no harbour, and its surf-beaten shores are too often strewn with wreckage. The explorers who have ventured to penetrate from this point into the inland plateaux report the existence of numerous burial-places. The most frequented trade route running south• westwards in the direction of the city of Harrar has its seaward terminus at Bulhar. But Samawanak and Dungareta have been spoken or as more convenient starting-points for the future railway, which has already ‘been projected, and which must sooner or later run through the Gadibursi territory towards the great city of the Upper Webi basin, easternmost station and bulwark of the kingdom of Shoa. Accordingly England and France have recently put forward rival claims for the possession of this future gateway to the interior of the continent from this direction. The English mean¬time retain in their hands the disputed station, recognising in return the absolute sovereignty of France over the Gulf of Tajurah, which also gives access to the inland regions from the head of the Gulf of Aden.